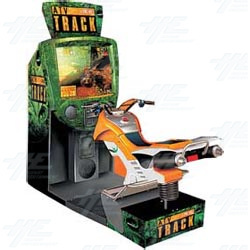 ATV Track is a racing game, featuring large ATVs Quads racing through the Amazon. It is a one player game that can be linked up to another unit for versus play. There are two playing modes, Practice and Competition. There are 4 different courses, and the player can choose from 4 Quads and 2 Riders. The main appeal of the game is the look and the feel. The cabinet is a replica of the outer shell of a ATV. The players journey starts at the beach, where you have got sand & trees to contend with. The trail then heads towards the forest and finishes in the Apurimac Fountains. There are two playing modes, Practice and Competition. There are 4 different courses, and the player can choose from 4 Quads and 2 Riders. The main appeal of the game is the look and the feel. The cabinet is a replica of the outer shell of a ATV. The players journey starts at the beach, where you have got sand & trees to contend with. The trail then heads towards the forest and finishes in the Apurimac Fountains.